On her return to the UK she undertook a two years Masters Level in Traditional Chinese Medicine to further enhance her skills and knowledge in that field. Mandeep has done further courses allowing her to specialise in Acupuncture care and treatment for infertility and IVF and enjoys providing care through pregnancy. As a well respected Osteopath she went on to publish a book on Osteopathic technique and has spent time lecturing both in the UK and internationally, in 2007 she was invited to lecture at the Beijing University of Chinese Medicine. 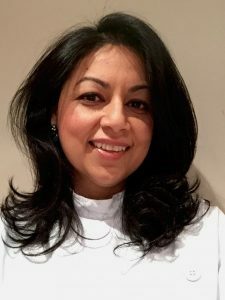 Mandeep is always further enhancing her skills in both Osteopathy and Acupuncture as she is committed to excellence in patient care. She is dedicated to offering the best treatment possible, therefore practices the well known manipulation techniques used by Osteopaths alongside gentler methods such as Koren Specific Technique. Mandeep Nandhra has been helping people lead healthier, more energetic lives by providing noninvasive and non-surgical wellness treatment. Mandeep’s straight forward and highly effective approach achieves long term health results for her patients and allows them to lead active lives. Mandeep is registered with the General Osteopathic Council and the Association of Traditional Chinese Medicine.